(CNN) -- "I think we have a problem." 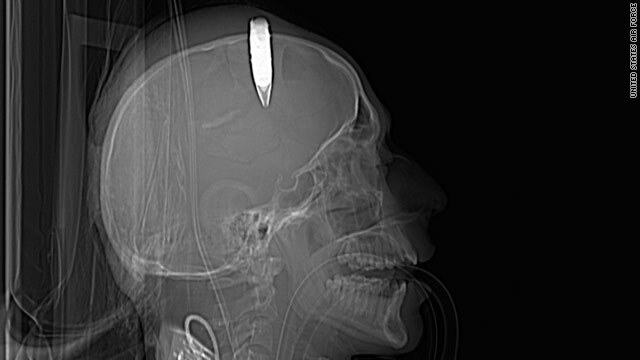 Lt. Col. Anthony Terreri, reading the CT scans of an injured soldier who'd just arrived at Bagram Air Base in Afghanistan, realized the shrapnel he saw lodged inside the soldier's skull wasn't really shrapnel at all. It was unexploded ordnance -- a live round of ammunition that could detonate at any time. The young Afghani soldier had arrived less than an hour before, after an IED had flung shards of metal into his head. "The internal part of the fragment was not solid metal, but it had a metal exterior," recalled Terreri. "There's an air gap at the end, a formed end at one side and the fragment was elongated." He looked at a second scan, a side X-ray of the soldier's skull, to confirm his suspicions. "The projectile was part of the bomb that went off," explained Maj. John Bini, who oversees all trauma care at Bagram. "People will pack just about anything in to these things: rocks, nails, screws, explosives." Bini and his team immediately summoned an explosive ordnance disposal team to assess how risky it would be to conduct the surgery. The doctors needed to minimize the risk of setting off the ordnance. They were told not to drop the explosive, prick it with a scalpel or let it be exposed to any electricity. "We knew that any electrical current possibly could cause detonation." Bini has been able to find roughly 50 similar cases in the history of modern warfare, but his team at Bagram was prepared. Nonessential personnel were immediately evacuated from the area and all electronic machinery was disconnected from the patient. Everyone else who remained donned flak jackets, including Maj. Jeffrey Rengel, who was manually administering anesthesia. "We had to turn off all volatile anesthetics because they could increase the magnitude of an explosion," said Rengel, referring to a class of anesthetics that would have been used to calm the patient. Because they are vaporous, the danger would be magnified if there was an explosion and those gases were in the air. "I resorted to counting the drips in my IV tubing to determine what was being delivered to the patient." Using a blood pressure cuff, a battery-operated heart rate monitor and some good old-fashioned arithmetic, Rengel monitored the soldier's vital signs while Bini prepared himself to operate. "The surgeon needed to be someone actually trained on how to do this, what procedures needed to be done. I was the one who knew how," said Bini. "The Air Force has an emergency surgery course ...[and] I'm the course director." Despite his training and his confidence, he was apprehensive. "As I was putting my body armor on and getting ready to walk in to operating room, I was going to tell somebody that if anything happens, tell my wife and children that I love them," said Bini. "But then I stopped myself. I didn't want to jinx myself," he said. "Surgeons are superstitious people." The round hadn't penetrated the patient's brain but had caused a significant fracture; portions of his skull were compressed against the outside of his brain. "I made a wide incision in the scalp down to the skull where I could lift off skin flap could actually see the projectile wedged underneath a flap of bone," Bini said. Out of fear that using metal tools would detonate the explosive, Bini was forced to abandon his clamps and scalpels. "I grabbed it with my hands, sort of worked it out, and really pulled it out with my hand." He handed the shell over to the explosives handlers, who safely removed it from the hospital. The doctors' skillful handling of the situation has drawn a lot of media attention. But they shrug it off as just another day at the office. "We trained to go to war and do surgery at war," said Bini. "I never thought I'd see one of these things in my lifetime, but you just prepare for it." "You fall back on those skills that all physicians have, going back to the basics of your practice," said Rengel. They argue the real heroes are the men and women on the front lines, not them. "Those guys risking being blown up every day, those guys are the ones taking the big risk," said Terreri. "We're safe compared to guys walking around down the roads."